In last week's post, Jen talked about the power of social media for finding authentic resources. 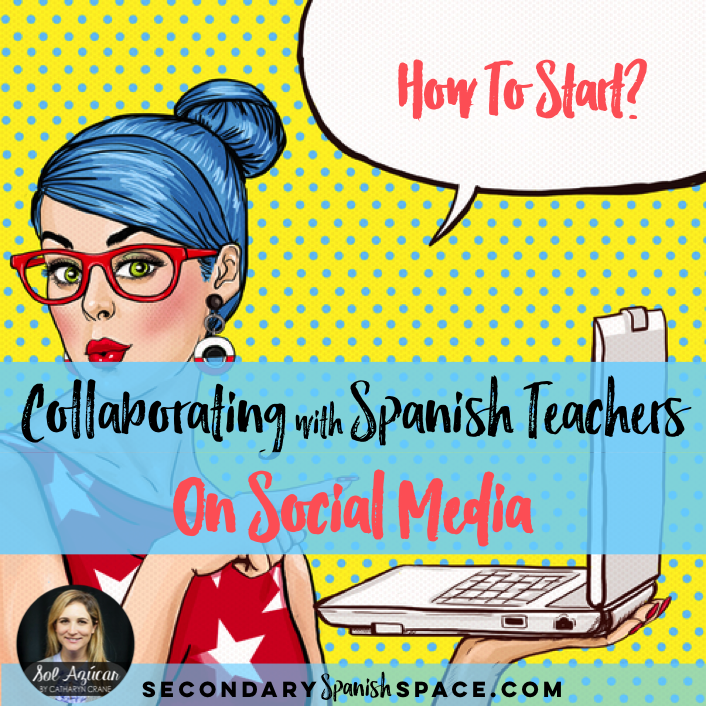 This week, we continue the social media discussion by talking about how to get online collaborations with other Spanish teachers started. Over the past three years or so, I've slowly joined a number of Spanish teacher online professional learning communities on sites like Facebook, Instagram, and Twitter. Facebook and Instagram are going strong, but my Twitter is pretty sad. I have maybe 5 tweets. Follow me and maybe you guys can inspire me to get on this platform more - I see huge potential! By connecting with Spanish teachers on social media, I am amazed at the simple, and meaningful interactions that I have with teachers from all over. I stretch my own thinking about what good language learning looks like. I learn about authentic resources, project ideas, and different instructional approaches. Just one example was learning about that awesome Soy Yo music video when someone mentioned it in a Facebook group the day after the video came out. Also, I am able to share my own stories and ideas, so I feel like I'm helping other teachers too. This connection has become a daily thing for me. I just love it. We've all heard about the importance of sustained professional development (PD) within the teaching profession. Central to good PD is building your Professional Learning Communities or Networks (PLCs and PLNs). Forgive all the acronyms... but what teacher doesn't love a few?! Good PD with your PLC/PLN is a great way to keep our ideas fresh, our classrooms effective, while helping to reduce teacher burn out. 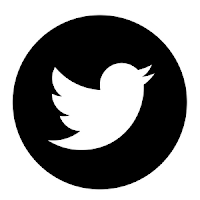 Finding a PLC/PLN on social media has the added benefit that your learning is 100% optional and totally self directed. There's no principal forcing you to attend the PLC meeting! You choose when to login and how much to contribute. You also can stay relatively anonymous online. Ask any and all questions in a "judgement free zone," where Spanish teacher peers will be happy to provide you feedback, without any pressure or local school politics involved. Better still, online PD even aligns with the ISTE standards for teachers. By participating in online communities, teachers stand to construct knowledge together in virtual environments (ISTE Standard 1), maybe even becoming virtual teacher leaders, who contribute to the effectiveness and renewal of the teaching profession (ISTE Standard 5). Look at how amazing you could be! Step 1. Identify what social media platform is best for you. Which platform do you already use in your daily life? Which platform seems easiest to navigate for you? 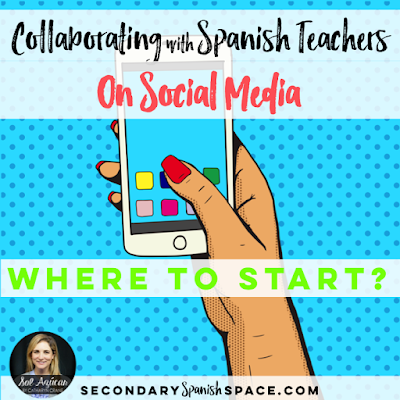 Which platform do your local Spanish teacher colleagues use? They may be a great resource as you are getting started. Do you prefer visuals? Go with Instagram! 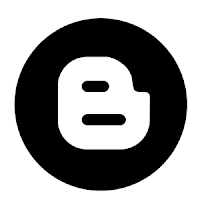 Do you want to be able to search easily through archived discussions? Do you want your discussions to be private? Go with Facebook groups! Do you want a diverse, large community and open access? Go with Twitter! 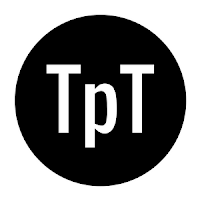 Note: You might want to use your own personal account (I do this for the private Facebook groups that I'm a part of - since they are not publicly viewable), or create a new "professional account" (I do this for Instagram and Twitter - since they are public). Step 2. Figure out who to follow. For Instagram and Twitter: You can always start by following the 10 of us Secondary Spanish Space teacher bloggers. On our About Us page, there are clickable links to each of our social media accounts. 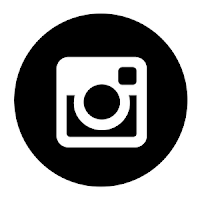 Also, check out Spanish Plan's Instagram post and Sra Cruz's Instagram post for a list of popular Spanish teacher related Instagram accounts and hash tags that may be useful. 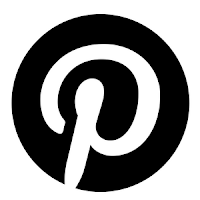 Carolina at Fun for Spanish Teachers provides a list for Facebook and Pinterest, too. 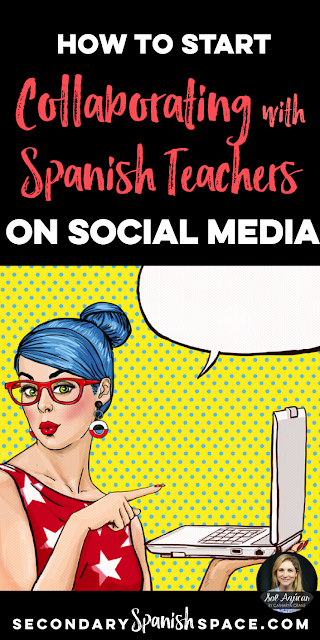 Once you follow a few Spanish teachers, find more connections by "stealing" from the list of people they follow. I also suggest searching for new people by using hashtags. It's ok to start out as an observer! Do this until you are comfortable in the group and understand the dynamics. Next you'll be ready to start commenting on others' posts. Eventually, challenge yourself to share a post of your own every now and again. I'm always super careful about sharing classroom pics and/or any identifying information about students. When I do share pics, I get written student and parent permission, as per FERPA regulations, and typically prefer to use pictures of the back of students' heads or with no visuals of their faces. Tag your virtual colleagues in your posts. Initiate personal communication with colleagues in the PLC / PLN who you respect. Ask them questions, share your stories. In my experience, social media engagement becomes addictive. It is crazy the relationships you can build with people you've never met in person! Our Secondary Spanish Space blog began as a series of discussions in a Facebook group! Not finding your niche? 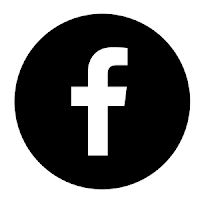 Start your own Facebook group or hashtag. You've got nothing to lose. Many of you are more connected than me! What hashtags do you like? What tips do you have for starting and growing your PLN? Looking forward to reading your comments! Excellent post! So thankful for all of my virtual teacher friends! Thanks, Laura! If you're comfortable sharing your social media contacts here in the comments, I'm sure others we'd all be happy to follow you and keep growing together. I think a PLN is extremely important to have or at least become a part of if you do not want to create one. I think it is challenging because of the amount of work a PLN requires for a teacher to connect with others in her field. But since our Spanish community is not the biggest, I believe we, as Spanish teachers, have a greater chance of having fruitful and highly interactive conversations! Thank you for your post! Thanks for chiming in! I agree that having a somewhat smaller community of Spanish teachers absolutely benefits us when it comes to PLNs. Lucky us!